Although only eight Pellston high school students boarded the bus to Bliss Gardens Farm, they brought enough energy to fill the bus’s full, 40-person capacity. Other passengers included Sherry Sedore, Pellston Public School food service director, Jen Schaap, Groundwork Center Local Food Policy Specialist, and myself, a FoodCorps AmeriCorps service member. 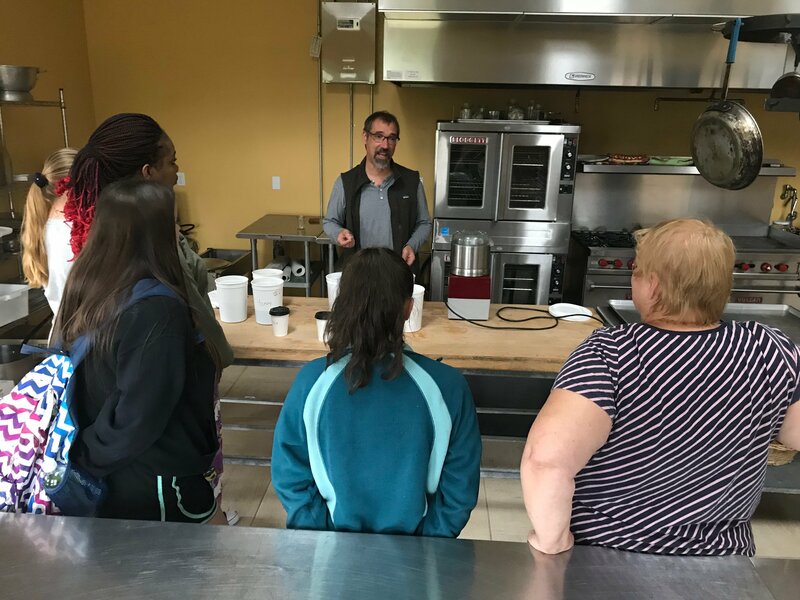 The owners of Bliss Gardens Farm & Community Kitchen, Mary and Craig Rapin, had graciously invited students back for a second field trip in 2018. The first took place in the spring, when students planted potatoes and carrots, and cleaned black beans from their pods. This second trip, which took place in September, gave students the opportunity to harvest those very same crops, which would be served at school lunch the following day. A batch of carrots was washed for use in the cafeteria the following day. At the farm, we left the bus to hurry through a light drizzle to a warmly lit barn. Inside, the Rapins greeted us and briefly explained the day’s activities. The group split in two. Some students ducked into the kitchen to perfect the breakfast bars, while others went out to the fields to harvest potatoes and carrots. In spite of the rain, the attitude in the fields was bright. Students honed their potato-digging skills and the excitement was infectious as they pulled spuds from the earth, tumbling them onto flats. Some students even harvested barehanded to enjoy the feel of soil. A few rows down from the potatoes, other students wiggled carrots from from the earth. Whoops of surprise and excitement filled the air whenever someone found “love carrots”—two carrots that have grown around each other in what appeared to be a romantic embrace. Greg Carpenter of Crooked Tree Breadworks shares his enthusiasm about quality ingredients with the students and Pellston's food service director. Many students opted for the kitchen activity, working alongside the school’s food service director. They all crowded around the prep table as Greg Carpenter walked them through the process of making the protein breakfast bar that Pellston students co-invented in the spring. The recipe included oats, Bliss Gardens Farm black beans, honey, cocoa powder, local whole wheat flour—and no sugar! Greg was sure to talk about the difference in nutritional value between white flour and whole wheat flour, and the difference in shelf-life. Store whole wheat flour in the refrigerator, or better yet, mill it and use it right away for best flavor, like he does in his Crooked Tree Breadworks. Hands got sticky and smiles ensued while the ingredients were mixed. The students then rolled the dough in a shallow sheet pan before sliding it into the oven. Then, as the bars baked, the students shifted attention to finalizing the name of the protein bar so they could move ahead with the advertising campaign. Madison Hutchinson (left) and Allison Kolodgy roll the protein-rich mixture into the sheet pan. Having the students take charge on promoting healthy and local food is fantastic, because it fosters peer-to-peer encouragement for students to select these foods on their own rather than being pressured to eat right by authority figures. In the kitchen, students devised plans to get the breakfast bars sold at the school store—yet another example of how Pellston high schoolers are excited to get healthy food in their school. 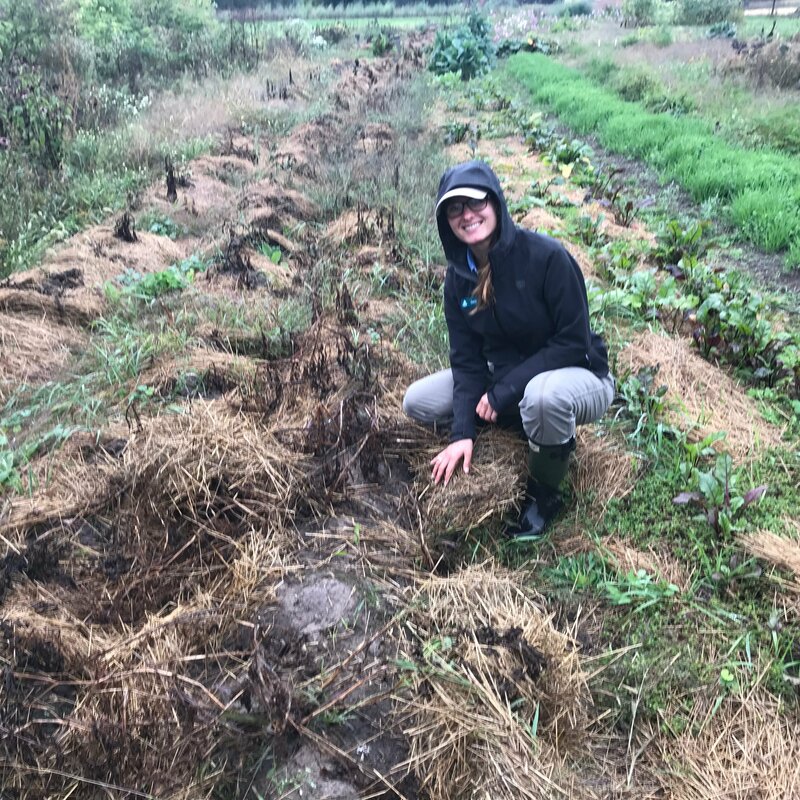 Of course, these opportunities for student leadership would not be possible without a strong community network of support, such as the network that brought students to Bliss Gardens Farm & Community Kitchen twice in 2018. One of the key players who made this trip possible was the food service director of Pellston Public School, Sherry Sedore. Unable to attend the field trip last spring, Sedore was thrilled to make the trip in September. 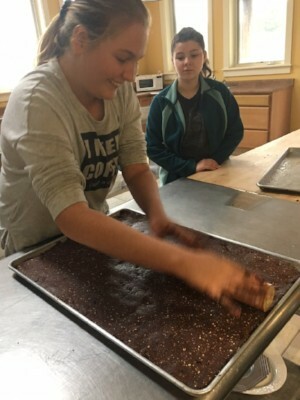 At the farm, she had the opportunity to learn about the breakfast bar recipe and plans to help students get the product available during breakfast and in the school’s store. Sedore is an advocate of promoting local food in her school, and often sources produce from Coveyou Scenic farm, Golden River Orchard, Northbound Farms, Ziibimijwang Farm, and (of course) Bliss Gardens Farm. While meeting with Sedore earlier in the year, she passionately spoke of her role in the school, the the unhealthy habits that are always looming over students, and that we have to create better options. She said there's no more time to wait: "We've got to do something RIGHT NOW." Being the food champion she is, Sedore is always on the lookout for opportunities that would make it easier for her to include more fresh and local produce in school meals. The Robot Coupe food processor that Greg used to make the Crooked Tree Breakfast Bars caught Sedore’s eye, as such a machine would help her prepare fresh and local produce more efficiently for students. The support from Bliss Gardens Farm, Greg Carpenter of Crooked Tree Breadworks, the Pellston Public School school nurse, Melanie Drier, and the Groundwork Center were also instrumental in orchestrating this hands-on learning experience for students. Although each of the stakeholders comes from a different background, they are all united under the belief that students should have access to healthy, fresh, and local food. October is Farm to School Month! Learn about how this is a national movement and discover the many innovative ways people are bringing healthy local food into their children's school cafeterias, at the National Farm to School Network website.